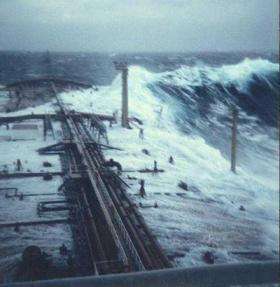 A freak wave approached this oil freighter, the Esso Languedoc, near Durban, South Africa in 1980. The masts are about 82 feet above sea level, but the wave, which broke over the deck, caused only minor damage. Photo credit: Philippe Lijour. On a stormy April day in 1995, the RMS Queen Elizabeth 2 was sailing in the North Atlantic when the ocean liner dipped into a "hole in the sea." Out of the darkness, a towering 95-foot wave threatened to crash down upon the vessel, which the 70,000-ton ship attempted to surf in order to avoid being pummeled to the bottom of the ocean. Fortunately, the ship and passengers survived, but the instance occurred just months after the first scientific recording confirmed the validity of old sailors' tales once considered skeptical: the existence--and prevalence--of freakishly giant waves, also known as rogue waves. Before the first laser measurement of a freak wave in January 1995, oceanographers and mathematicians predicted that such monster waves should only occur about once every 10,000 years. But as the occurrence inspired satellite measurements, scientists observed many more freak waves than theory predicted. In fact, observations imply that a handful of these waves is occurring at every moment somewhere on the ocean. Although it's controversial just how many ships and lives have been lost in modern times due to these fairly common giant waves, most ships today are only built to withstand waves up to 50 feet tall--while freak waves have been calculated to reach heights of up to 198 feet. Technically, a freak wave is defined as a wave that is twice the "significant wave height," which is the mean of the largest third of waves in an area. Intrigued and terrified by freak waves and their potential for swallowing giant ships whole (from oil rigs to cruise ships), scientists are trying to formulate a theory or theories to describe the evolution of these mythical realities. Recently, scientists from Sweden and Germany, Padma Shukla et al., have presented the first analysis and simulation of its kind for the instability of nonlinear waves interacting in deep water. In the past, nonlinear theories have seemed capable of explaining the greater prevalence of rogue waves than previous theories which were linear. "The basic reason for the occurrence of freak waves seems to be what is known as nonlinear wave interactions--by a certain mechanism there is an energy exchange between the waves resulting in a large growth in wave amplitude, much larger than what would be possible through ordinary linear superposition of waves," coauthor Mattias Marklund told PhysOrg.com. Nearly all waves originate as ripples on the water's surface blown by the wind. (The exception is tsunamis, which are caused by seismic tremors on the ocean floor and only become dangerous when they reach the shore.) Most waves, however, die down due to viscosity in the water, unless heavy winds cause the swells to increase. Scientists believe that heavy winds--especially when blowing in the opposite direction of the water current--play a large role in forming freak waves. This idea may explain why locations with strong currents (e.g. the Agulhas off Africa and Gulf Stream off the U.S., including the Bermuda Triangle) have a history of reported freak waves. "The freak wave a phenomenon is important to understand since it may be the cause of serious accidents involving oil platforms and ocean-going ships," said Marklund. "If a greater understanding of the mechanisms behind these waves is obtained, one may, for example, in the future combine this with observational and statistical tools in order to construct warning systems." Shukla, Marklund and their colleagues built their theory on a two-wave system, where two waves interact nonlinearly, which is described by the Schrodinger equations. These quantum mechanics equations, originally developed to describe the wave-like behavior of electrons in atoms, have since been used for a variety of wave systems. The scientists found that two-wave cases behave much differently than single waves, which exhibit standard instabilities and dissolve into a wide spectrum of waves. "We have presented a theoretical study of the modulational instabilities of a pair of nonlinearly interacting two-dimensional waves in deep water, and have shown that the full dynamics of these interacting waves gives rise to localized large-amplitude wave packets," wrote the scientists in a recent issue of Physical Review Letters. "[T]wo water waves can, when nonlinear interactions are taken into account, give rise to novel behavior such as the formation of large-amplitude coherent wave packets with amplitudes more than 3 times the ones of the initial waves." Using the Schrodinger equations, the scientists studied the impact of different wave speeds and different angles at which two waves intersect. The team found that for a certain, relatively small angle, a new instability arises with a "maximum growth rate that is more than twice as large as the ones for the single wave cases," they report. Two waves meeting at such an angle would escape normal stabilizing effects and exhibit constructive interference that would result in a freak wave. Strong currents can help further by "focusing" waves, continually building them up to giant sizes. "This particular piece of research describes a possible mechanism behind rogue wave formation," said Marklund. "In order to statistically predict their location, one will need further observations and analysis of such data using various methods, in particular statistical analysis and computer simulations." Citation: Shukla, P.K., Kourakis, I., Eliasson, B., Marklund, M. and Stenflo, L. "Instability and Evolution of Nonlinearly Interacting Water Waves." Physical Review Letters. 97, 094501 (2006).